I’m preparing a virtual laboratory for IDS and Honeypot testing that will be running on my OpenNebula private cloud. 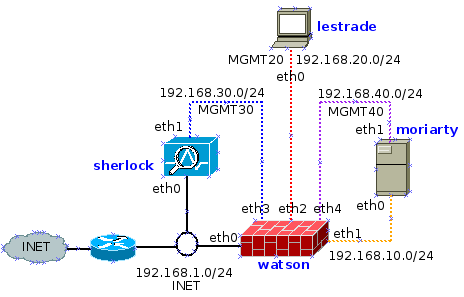 In the following diagram you can see that I want my IDS (sherlock) to inspect traffic from/to my Vyatta firewall so I’ll do that configuring port mirroring, thanks to openvswitch impressive functionalities. (I’ve used Dia for creating this diagram, what a great tool!). My N40L server has only one physical ethernet interface (eth0) and I’ve already created an openvswitch bridge called br0 which is associated to eth0. In OpenNebula I’ve configured one virtual network called inet which is assigned to br0. 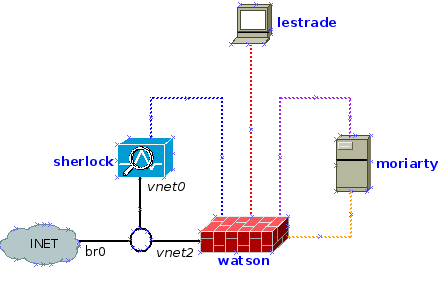 Watson (my vyatta router) and Sherlock (my OSSIM machine full of sensors) have one interface attached to inet/br0: vnet2 and vnet0 respectively. Well, ovs-vsctl man page is full of info so if I find more interesting things I’ll let you know.